This shoulder bag is a lot of fun to make. 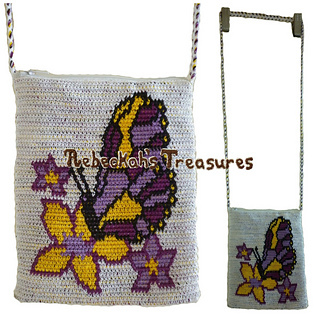 Perfect for anyone who adores flowers and butterflies. It is about 6”-7” long/wide, just the right size to carry a passport, wallet, keys and other bare necessities for when you do not wish to carry a large bag. 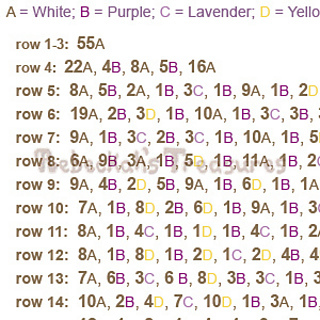 Written instructions along with a colour coded graph and a word chart is included in this pattern. 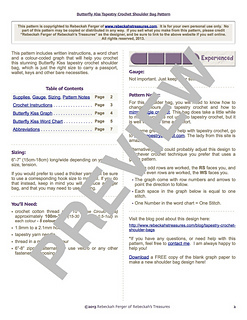 The graph is specially made for Tapestry Crochet. 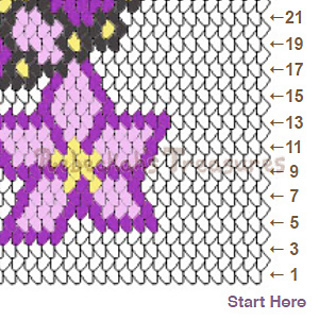 Though alternatively, you could adjust this design to whichever crochet technique you prefer that uses a graph pattern. I used a 2.1mm hook and crochet cotton lace for this pattern, but if you would prefer to make a larger bag, all you have to do is use a thicker yarn, and a corresponding hook size to match it. Happy Hooking!